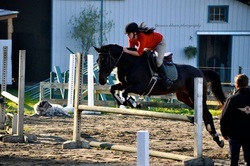 "Charlie" is an easygoing, beautifully schooled Performance Hunter stallion. Jumps the open water, liverpools, devil's dyke and more with ease. "Cassie" has been bred and raised here on the farm and shows great aptitude for the jumper ring. She would suit a confident junior or amateur looking to be competitive in the 1.10-1.15m ring next season with potential for more. Fiona is a brave, playful, and dynamic mare with tons of scope and potential.